It is amazing to watch the interaction between these two young, fun-loving adults. Both are geniuses in their own way. One is an artist. The other, a computer whiz. And they both share a fantastic camaraderie. They have a special connection and enjoy spending time with each other. They’re both blessed with a sense of humor and the gift of laughter. The best part is that they connect with each other without the need to use too many words. Both these young adults are on the autism spectrum. One of them is non-vocal, while the other uses limited words. 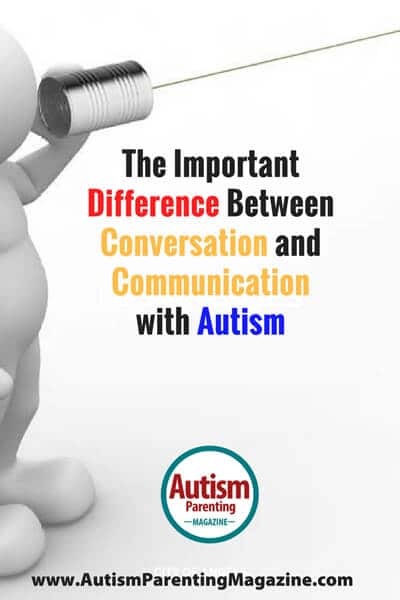 Restricted communication is one of the characteristics of autism. Please note that I said restricted communication and not speech – because instances like these make me realize that communication is much more than words. Here’s a conversation sample between a 16-year-old who is on the autism spectrum and his classmates. He attends 9th grade in a regular school. It breaks my heart to hear that such one-sided conversations occur every single day. They occur regardless of the answers that the boys come up with. Over a period of time, the boys have stopped interacting with him. The parents face problems at home due to his controlling nature. Needless to say that the absence of friends in their son’s life bothers them terribly. Let me say this again – communication is much more than words. So if you are measuring communication with the number of words a child speaks, you are missing something. There is a marked difference between conversation and communication. The scenarios explained above highlight the difference. Conversation is the exchange of words. Communication, on the other hand, is the sum of several important parts. It includes the act of thinking about what we want to say, and basing our response on the behavior of the person(s) in front. Many parents are desperate for their child to talk. If you have the same question, I understand your pain and anguish. I want to reach out and help you. Communication is about how effectively those words are used in a back-and-forth exchange. It is about being interested in what your partner shares; it’s about reciprocity. One of my students was in the habit of asking the mothers who came to our center what they had cooked that day. The delighted mothers would answer elaborately. But he was not interested in their answers. In fact, he didn’t even wait for them! He probably had been taught to ask certain questions to increase his ‘wh’ repertoire. You can teach rote answers to questions. But effective communication involves mindfulness. It involves being aware of what is happening around us in this dynamically changing world. When we lived in Dubai, we went for a walk to the beach almost every day. It was funny, initially. He hadn’t been to the beach. But it was a learned response. It was a response that would get people to move on with the conversation or to leave him alone! We communicate to share our emotions, knowledge, experiences…there is joy in sharing. We communicate to exchange ideas. Emotional sharing forms the foundation for self development and understanding others. It forms the very basis of communication. If emotional sharing is not in place, it results in unnatural and superficial communication. You don’t want that for your child, do you? Have you seen a conversation between deaf and/or mute people? The conversation is marked by animated facial expressions, gestures, use of body language, and sharing of emotions. It’s mesmerizing! Yet, no words are used. Shouldn’t we be working on developing this extremely important foundation of nonverbal communication for those on the spectrum? We communicate with people because we WANT TO connect with them. I’m talking about intrinsic motivation. Observe your child or your students. Are they motivated to talk to each other? Who is doing more work to communicate? Are you putting in all of the effort to get a response, or is the child initiating the conversation? So, how do we get to this stage of developing communicative intent? How can we make a child communicate rather than simply talk? How can we understand what works for them? I’m not going to beat around the bush. Co-regulation is the solution. It appears to be a complex word, but it’s quite simple. I’m going to tell you something that you might not know: it’s never too late to bring about a change. You can have the most amazing relationship with your child – a relationship based on sharing and caring. This article, however, is the tip of the iceberg. Click here to read how you can develop co-regulation and build communicative intent in your child, and find out what happens after that. Kamini Lakhani is passionate about the cause of autism. Her mission is to empower families affected by autism. She is the Founder of SAI Connections, a center for children, adolescents, and adults on the autism spectrum. She has been providing services in this field for the past 20 years. She is a Behavior Analyst and the RDI Director for Professional Training in India and the Middle East. She envisions a world where autistic individuals live independently, with respect and dignity. Her inspiration comes from her now-adult son, who has autism. You can follow her blog and connect with her on Twitter (@CalmKamini).